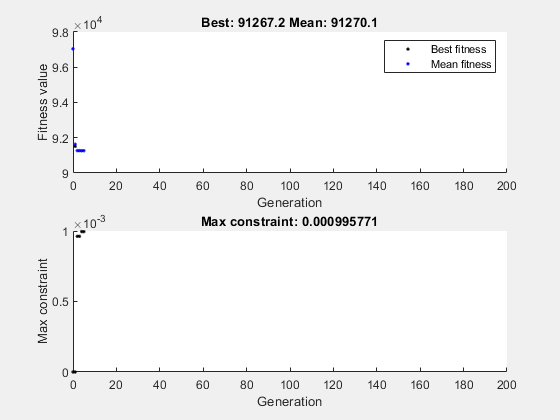 This example shows how to minimize an objective function subject to nonlinear inequality constraints and bounds using the Genetic Algorithm. The above fitness function is known as 'cam' as described in L.C.W. Dixon and G.P. Szego (eds. ), Towards Global Optimisation 2, North-Holland, Amsterdam, 1978. The Genetic Algorithm function ga assumes the fitness function will take one input x where x has as many elements as number of variables in the problem. The fitness function computes the value of the function and returns that scalar value in its one return argument y. The ga function assumes the constraint function will take one input x where x has as many elements as number of variables in the problem. The constraint function computes the values of all the inequality and equality constraints and returns two vectors c and ceq respectively. To minimize our fitness function using the ga function, we need to pass in a function handle to the fitness function as well as specifying the number of variables as the second argument. Lower and upper bounds are provided as LB and UB respectively. In addition, we also need to pass in a function handle to the nonlinear constraint function. Note that for our constrained minimization problem, the ga function changed the mutation function to mutationadaptfeasible. The default mutation function, mutationgaussian, is only appropriate for unconstrained minimization problems. The ga solver handles linear constraints and bounds differently from nonlinear constraints. All the linear constraints and bounds are satisfied throughout the optimization. However, ga may not satisfy all the nonlinear constraints at every generation. If ga converges to a solution, the nonlinear constraints will be satisfied at that solution. ga uses the mutation and crossover functions to produce new individuals at every generation. The way the ga satisfies the linear and bound constraints is to use mutation and crossover functions that only generate feasible points. For example, in the previous call to ga, the default mutation function mutationgaussian will not satisfy the linear constraints and so the mutationadaptfeasible is used instead. If you provide a custom mutation function, this custom function must only generate points that are feasible with respect to the linear and bound constraints. All the crossover functions in the toolbox generate points that satisfy the linear constraints and bounds. We specify mutationadaptfeasible as the MutationFcn for our minimization problem by creating options with the optimoptions function. % Next we run the GA solver. Next we use optimoptions to select two plot functions. The first plot function is gaplotbestf, which plots the best and mean score of the population at every generation. The second plot function is gaplotmaxconstr, which plots the maximum constraint violation of nonlinear constraints at every generation. We can also visualize the progress of the algorithm by displaying information to the command window using the Display option. A start point for the minimization can be provided to ga function by specifying the InitialPopulationMatrix option. The ga function will use the first individual from InitialPopulationMatrix as a start point for a constrained minimization. Refer to the documentation for a description of specifying an initial population to ga.